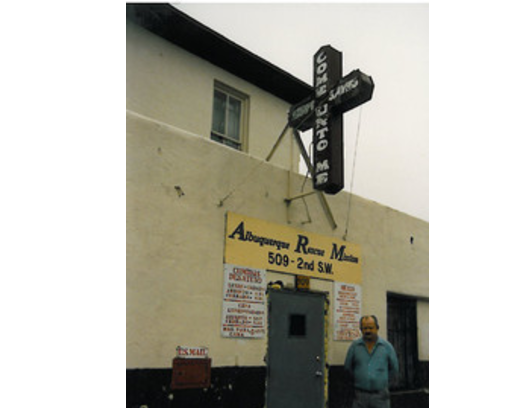 The Albuquerque Rescue Mission was founded 1954 as Albuquerque Gospel Mission. Arthur Fleischer and his wife moved from Chicago to Albuquerque specifically to start the Mission after being powerfully impacted by their involvement in the Pacific Garden Mission. The mission was a ministry to the poor and homeless men and women of Albuquerque. A house on First Street was the original site, providing ministry, shelter, food, and clothing. A building and property on Second Street was donated 1960, by Local Union Number 611 International Brotherhood of Electrical Workers. The Albuquerque Rescue Mission operated from that location for nearly four decades, with a separate dormitory building added in 1973. In 1999, a 24,000 square foot Restoration Center was opened. It included a Learning Center, a Courtyard, Dining facilities, a Donation Processing Center, and multiple areas for Emergency Shelter. In 2017, the Albuquerque Rescue Mission became Steelbridge. The mission of "transforming lives through the power of God's love" remains the focus of our work. The expansion of Residential Programs at our downtown campus reflects our response to the changing needs our city. Capacity for housing men and women in our programs has almost tripled. Today, there is room for 72 men and 26 women in the New Life Program for men and Women's Center of Hope. Our emergency services for the public have increased and been relocated to just outside the downtown area, at the Steelbridge Resource Center (2021 Second Street NW). In a strategic move to reduce duplication of services, we collaborate with The Rock (2400 Second Street NW) to provide meals for the homeless and those suffering from food insecurity. The needs of our community have changed since 1954. We've changed to meet them. The work we do is needed now, more than ever. With the adaptation to these new challenges we wanted our name to reflect more than just a soup kitchen, and Steelbridge was born! Steel: (Old High German stahal), related to "standing fast," "to stand, place, be firm." Steel is created when coal and iron are heated in a furnace to remove all impurities. Coal and Iron are the streets on the north and south side of our downtown campus. Bridge: 1. A structure carrying a road or path across or over an obstacle. 2. Something that is intended to reconcile or form a connection between two things.